HiTec Center LLC has installed Clear-Com’s FreeSpeak II and HelixNet systems at the Royal Guard of Oman’s performance space. The system has been supplied by Nicolas M Kyvernitis Enterprises (NMK), audio, video and communication distributor in the Middle East. HiTec Center, an audiovisual integrator and reseller based in Oman, was looking for a complete communication solution covering a whole venue, from the reception to the green rooms. Clear-Com’s seamless integration between wired and wireless together with an expandable antenna system to cover the whole venue made their decision easier when considering the various options. FreeSpeak II Wireless Intercom is the next generation distributed wireless solution that operates in multiple world-wide license-free frequency bands. 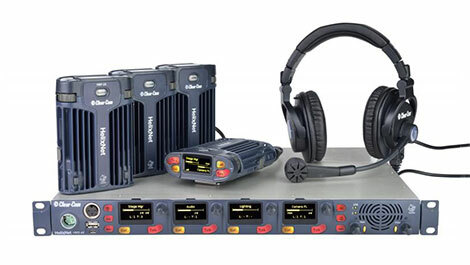 The HelixNet Partyline provides power and networked channels of audio to support up to 20 digital beltpacks. “We needed mobile communication system for the stage technicians and artist assistants and fixed intercom for standard show controls and show management. Based on my previous experience with Clear-Com analogue wired and wireless systems and their product reliability and ease of use for the end user we opted for FreeSpeak II and HelixNet systems,” commented Philip Perry, Business Development & Projects Manager at HiTec Center LLC. HiTec Center LLC is an experienced company with the synergistic focus to bring the most advanced technology solutions to the market. Company provides the integration for recording studios, auditoriums, hospitality, healthcare, broadcast, military, government, education, corporate and private sectors. They are specialised in high-end professional audio and world-class luxury home theatres. “I must admit that I have used many products for large live shows and Clear-Com is the only brand that is always reliable. Moreover we have received helpful install advice and configuration assistance from NMK team,” he added.